Navigate to the article or chapter you want to link to. 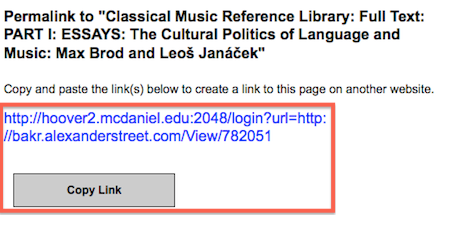 Click on the "Embed/Link" link under the article/chapter title. Copy the link and paste into Blackboard - no proxification is required. NOTE that you will want to verify that the item still exists before each term - library subscriptions to electronic items are not always permanent. If the video you are using has disappeared, contact the library to investigate other means of accessing that item.